What could a donut possibly have to do with this ancient history, you might ask. Well, to make sufganiyah you need to deep fry them in oil - a reference to the miraculous oil that kept the fire burning. As a Jewish kid growing up in the neighbourhood of Le Marais in Paris, December was the highlight of my year: it marked the return of sufganiyot in my favourite bakeries. Sufganiyot (סופגניות‎), a feminine plural of the Hebrew word sufganiyah (סופגנייה), are the quintessential Hanukkah celebration treats. They are Kosher donuts, stuffed with various flavours (chocolate, apple puree, strawberry jam), and very similar to traditional French beignets, except every Jewish family has their own recipe. They are eaten once a year during Hanukkah – the festival of lights. Hanukkah is often described as the Jewish equivalent of Christmas, leading to a very American neologism in pop culture: Chrismukkah. Hanukkah occurs every year in December and lasts eight days, during which family members gather around a Hanukiah, light the candles, sing prayers, give gifts to each other and eat sufganiyot. 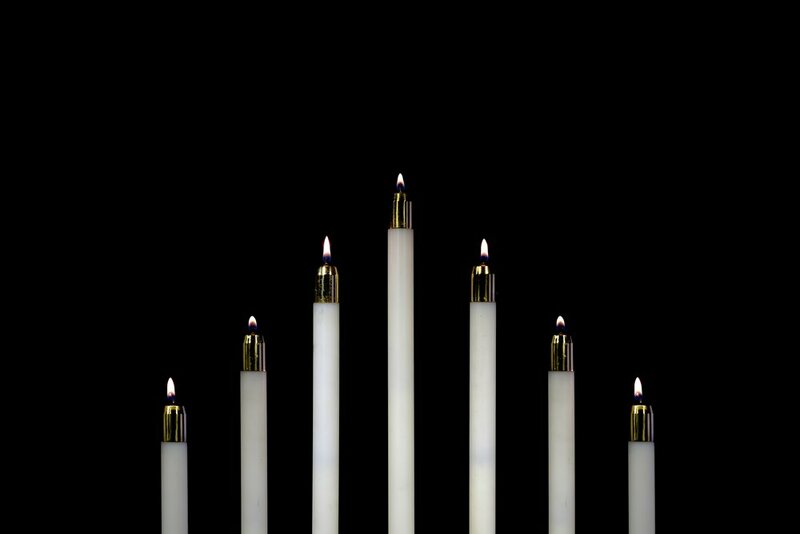 During Hanukkah, we celebrate the miracle of the light that lasted for eight days. In 170 BC, the Greek king Antiochus IV invaded Judea and conquered Jerusalem. He outlawed Judaism and sent his army to loot and spoil the Second Temple. After five years of Greek oppression, a Jewish revolt led by the Maccabees, succeeded in overthrowing Greek rule. The Temple was restored and a new altar was built in place of the pagan altar to Zeus. A new Menorah (candelabrum) was placed in the Temple to replace the one that had been stolen. However, the Menorah was required to burn day and night, and oil was scarce. The Maccabees found a small cruse of pure olive oil bearing the seal of the Kohen Gadol (High Priest). Although there was only enough oil to light the candle for one day, the Menorah miraculously continued burning for eight days, just enough time to get a new oil supply. Thus, lighting the candles of the Hanukiah for eight days every year is a commemoration of the miracle that came with the rededication of the Temple. What could a donut possibly have to do with this ancient history, you might ask. Well, to make sufganiyah you need to deep fry them in oil - a reference to the miraculous oil that kept the fire burning. In the 21st century, this fried food keeps the hunger away: sufganiyot may be found in any Jewish bakery around the world. Among the many Ashkenazi bakeries in the Rue des Rosiers in Paris, my favourite is the Sephardic bakery Murciano, where they make (in my opinion!) the best challot (Shabbos bread), honey oriental pastries, and also rugelach, which is the favourite chocolate croissant of Ashkenazi Jews. If you have the chance to be in Israel in December, just wander around the Jewish quarter of the old city in Jerusalem and let the smell of freshly fried sufganiyot guide you. And if you can cope with the persistent smell of oil in your kitchen, then do it yourself! Tablet Magazine posted amazing Sufganiyot recipes on their website and they even have a vegan version. Culinary traditions are key to Jewish cultural transmission from generation to generation. In the broad family of Jewish sweet fried treats, it should be pointed out that sferies are also a must-taste. Algerian Jews cook them during Passover (Easter) – during which leaven and yeast are forbidden. Sferies are made with matzo flour, fried and finally dipped into syrup or honey. So keep an eye on the calendar and enjoy a whole year of celebrations and delicious treats. DEBORAH ASSERAF is a young food enthusiast based in Paris. Her French-Jewish heritage makes her quite passionate about not only wine and cheese but also shakshuka and almond and honey pastries.